They might look like regular (albeit pretty) socks, but no. They are very much more than regular socks. These are the things that will help me get through the cold winter long before they get the chance to look pretty with a nice skirt, come springtime. These are keeping the cold draft from flying up my pant leg and chilling me to the core. (Well, that along with a knitted sweater). These are knee-highs. Ta-da! The first finished project from my Rhinebeck 2007 purchases. Pattern: None. A personalized process which I will discuss below. Notes: These contain elastic thread knitted into the cuff, as is my preference – I think every pair of knee socks I make will continue to have elastic in the cuff, it keeps ’em sturdy and staying up where you need them. Elastic + leg shaping is my anti-slouch plan. For both the leg and foot, it is better to err on the side of too LONG than too short. If the leg or foot is too short, it will pull down as you wear the sock, and you’ll be constantly tugging them up to keep from falling down. For me, for this weight of yarn, I would knit evenly in stockinette for about 4 inches after the cuff, then decrease 2 stitches (at the “back” of the leg) every 4 rows 5-6 times, then every 3 rows for the rest of the decreases. If I was using a slightly smaller gauge I would probably do all my decreases every 4 rows. 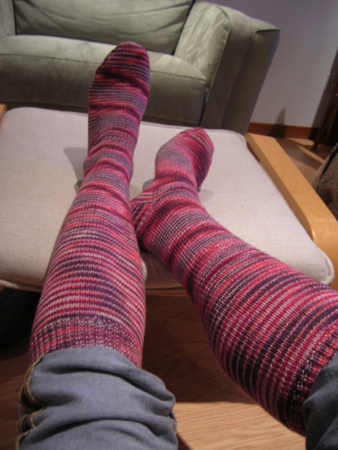 Then, this still leaves me with a few inches of even stockinette to hug my leg around the ankle. Your leg may be different, though – you might want to do your shaping in a way that stops almost directly at the ankle itself, depending on the shape of your leg. [EDIT]: Oh yeah, and one more thing: try the sock on OFTEN. This is key. It’s better to know that you need to add a bit of extra length or re-start the shaping a bit earlier or work the decreases a bit farther apart before, say, you finish the entire sock. I try mine on 3 or 4 times throughout the whole process. Then just use the 1st sock as a guideline for the 2nd. After that, the rest involves the same set of decisions you’d make for any other sock – what kind of heel? (I used the flap. Definitely love the sturdy flap heel) What kind of toe? How long to make the foot? How to stave off boredom of knitting more and more stockinette? Ah yes, such a lovely nuanced decision-making opportunity, socks are. All in all, this is the sort of thing that takes a lot more energy to explain than to actually execute. And I fully plan on having more custom-fit knee socks entering into my closet! The socks are fab and you are a genius. Great socks. I haven’t had the endurance to knit knee length socks — but perhaps if I was back in Canada I’d reconsider! So cute! I need a pair of knee socks like that – keep me toasty!!! These socks are something else! I would never have the patience though for all that stockinette. Stay warm! If NY is this cold I don’t even want to think about how bad you guys must be up there! 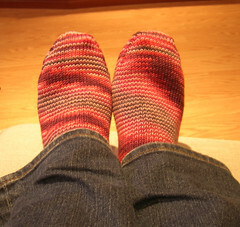 You are among the very Top Clever Women I know… fantastic socks and a great tutorial, you always make such great sense! Stay warm, dude, it’s COLD up there!! Gorgeous socks! I really should make myself a pair. This weather requires knee socks! Beautiful socks! I love, love, love knee socks. I used to think I couldn’t hang in long enough to knit a pair but you make me reconsider. 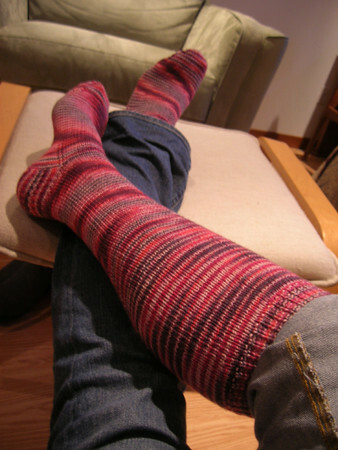 I’ve been playing around this week with sock shaping – decreases versus changing needle size. You are right that the shaping + elastic produces minimal slouch! Wow, I remember when those socks were just some ribbing and elastic. Good job, they look great! They also look like they may fit me…. Thank you for the long socks tips, they are great. Do you have any staying power spare too?! I have trouble casting on for a second short pair! Great socks! I love me some knee socks, especially in this kind of weather. I adore knee socks- I love the extra warmth and leg coverage, with out the ickyness of tights. I hate tights! But I love knee socks. Thanks for the approximation on the yardage, always helpful! Wow – I can barely hang on through anklets – can’t even imagine knee socks – you rock! Mmmmm…beautiful, and perfect for keeping out the cold. I have been meaning to give knee socks a try for soooo long! Thanks for such lovely instructions. 🙂 I may just take the plunge for my next pair! These are very beautiful kneehighs. I love the color and how the magenta “snakes” around your foot. please please please tell about what elastic you used and how you knit it into the cuff. I want to knit these for my son who is at college but after reading your post, I guess I have to wait for him to come home to try them on as I go! Too bad. Sorry for that huge review, but I’m really loving the brand new Zune, and hope this, as well as the excellent reviews another individuals have written, will help you decide if it is the right choice for you.